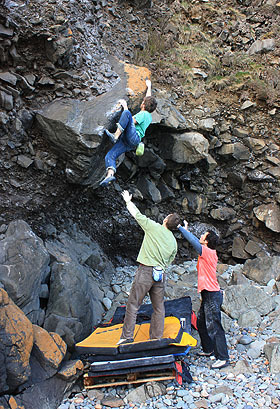 North Wales Bouldering News ::: News Details :: The Ysgo Diamond 6B! 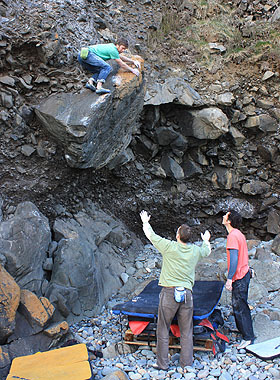 In an unprecedented break with tradition Jonny Ratcliffe has climbed one of Big G’s Boulders of the Month. 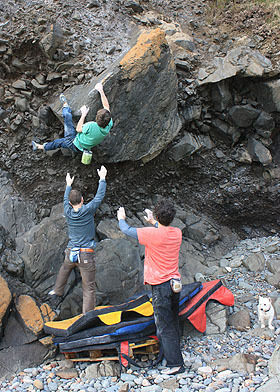 Over the Easter weekend a team of exhausted winter climbers descended upon Porth Ysgo, looking for some much needed rest and recuperation (after all the strenuous shuffling they had been doing in the snowy white stuff). 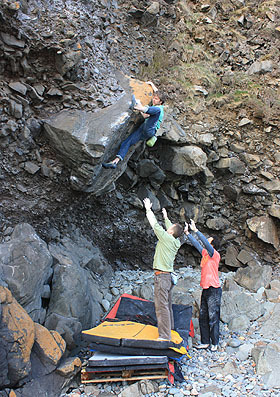 With power restored - by elaborately garnished barbecue sausages no less – a little light exercise was sort upon the adjacent boulders. With all possibilities spent in the immediate area, attention turned towards the great Glued Diamond, that had been highlighted in the March BotM feature. A driftwood pallet was commandeered to help even the landing, and with all pads neatly piled up, attempts began. 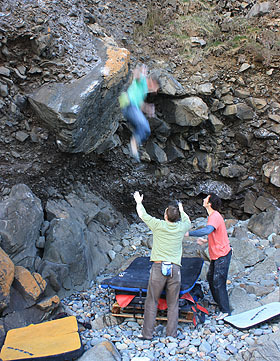 Si Jones and Andy Scott fought valiantly, but in the end it was the Hobbit-like-tenacity of Jonny boy that won the day. 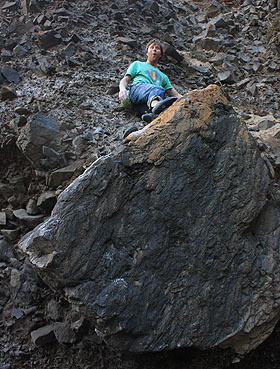 Topping out on the boulder’s apex, Jon’s summit glee was immediately tempered by the conundrum of how he would get down, access above being blocked by the sort of overhanging mud cliff that only the likes of Crispin Waddy would dare to scale. “Jump, you fucker, jump!”, cried the amassed crowd – and after a brief psyche up Jon affected a relatively graceful dismount, ably spotted by Si and Andy. Upon hearing the exciting news Big G was moved to the brink of tears and had to be revived from his emotional tangle with the liberal application of the strongest smelling salts available. Declared Big G, before marching off into the distance, his gait as strident as his new found purpose.